KIEV, Ukraine -- Ukraine can successfully compete on the international arena if its innovation potential is realized. This idea was expressed by Steve Ballmer, CEO of Microsoft Corporation during his one-day visit to Kyiv last Friday. He met with President of Ukraine Viktor Yanukovych and government officials to discuss Ukraine’s competitiveness on the world stage, its desire to build an innovative economy, solve the problem of protecting intellectual property, and Microsoft’s assistance to the government in these processes. “With more than 200,000 software developers working in Ukraine, including 100,000 students majoring in technical professions at universities, Ukraine is ready to become a leader in creative development and innovation. Microsoft plans serious cooperation with Ukraine and we will continue to share their experiences and best practices with the Ukrainian government, business, and educational sector,” Ballmer is quoted as saying in the Microsoft press release. During the meeting with Ukraine’s Deputy Prime Minister Borys Kolesnikov, Ballmer discussed software legalization in the central bodies of state governemnt, the development of an e-government in Ukraine, and cooperation on a number of national projects, such as nominating Ukriane as a candidate to host the Winter Olympic Games in 2022. Now Microsoft will support Ukrainian business, education, and the public sector in adopting “cloud computing” — a new solution based on the storing and processing information online. Ballmer discussed the posibilities of “cloud computing” for the software industry with a group of Ukrainian startup enterpreneurs, who want to enter international markets with their innovations, as well as with more than 150 students of technical specialities, who gathered at the National Technical University of Ukraine Kyiv Politechnic Institute (NTU KPI). “We are fascinated with the current changes in the IT industry — ‘clouds’ make us think in a new way about the concepts such as access to information, confidentiality of data, and hardware design. These changes may have the same impact on society as had the appearance of personal computers, which gave people new opportunities. 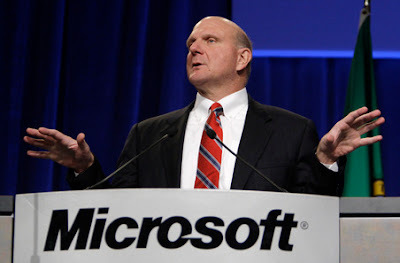 The students are the future IT leaders and it is they who can use ‘cloud computing’ to help create more innovations for Ukraine,” Ballmer stressed in his speech to students. Microsoft CEO praised the scientific and technological potential of Ukraine and noted that their company knows and appreciates Ukrainian engineers and developers. For example, as of today nearly 500 of KPI graduates work for Microsoft. Moreover, now the company is the largest investor in information technology of our country: the Ukrainian Microsoft “ecosystem” has 1,500 registered partners, employing more than 150,000 developers, manufacturers, distributors, and service providers.